Marlon Hill is an attorney and partner with the firm of Hamilton, Miller and Birthisel. He is a Miami Fellows (Class I) alum, inaugural Ruth Shack Leadership Award honoree and a past Foundation trustee. He shared how his Fellows experience shaped his Miami story, and the legacy of civic leadership and engagement he seeks to leave in Greater Miami. My Miami story is that of a young kid from Kingston, Jamaica who tries to find his way, understand a new culture, and eventually settle in to find a purpose. It is one about assimilating, acclimating and integrating into the new community –and making a contribution that is exponential. After returning to Miami from law school at Florida State University, I knew that I wanted to continue working with students of immigrant descent, especially those from the Caribbean. I was looking for ways to get more deeply connected with the community, and I heard about an emerging leadership program called the Miami Fellows at The Miami Foundation. The fellowship appealed to me so I applied, and when I first got the call as a finalist, I was grateful just to get an interview. To share my story, to talk about who I am and what I care about here in Miami was a great opportunity in and of itself. I met with a panel of four community leaders and Foundation President Emeritus Ruth Shack. 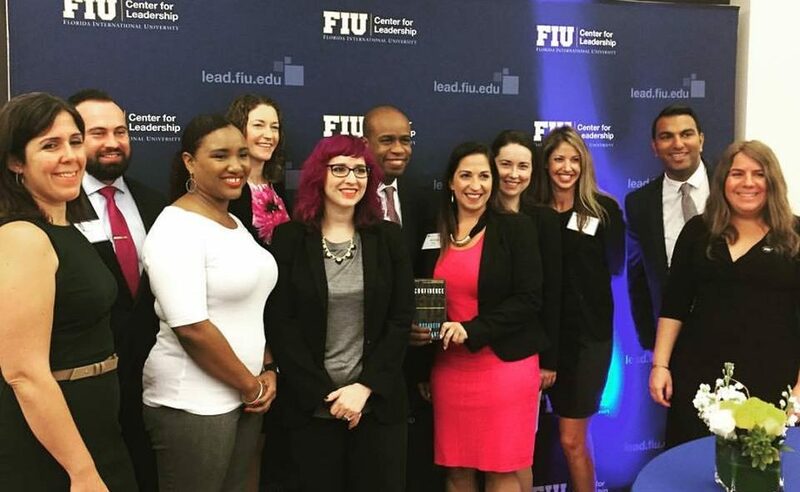 I was honored when they selected me as one of 18 emerging leaders for the Miami Fellows’ inaugural class. The program gave us a sense of what our community was all about and our role in it. Over the next two years, we completed hands-on labs, interacting with various parts of our local community and internationally in Brazil. We met with community leaders, business executives and elected officials. We learned about ethical leadership, negotiating and fundraising. We explored complex issues such as the local politics of race and ethnicity. We discussed important civic issues and ways to solve them in Greater Miami. At the same time, a little kid named Elian Gonzalez had just arrived here, and our community was debating whether to send him back to Cuba or allow him to stay. As colleagues, we talked about the complicated issues that arose from the unfolding story. It was a historic time, and the Miami Fellows program gave me a full picture of what shapes a city like ours. My time with the Fellows, 1999 to 2001, was a huge turning point for me, and I knew then that I would live in Miami for the rest of my life. Since completing the program, I started my own law firm, served on a number of different boards as a corporate lawyer, written several op-eds for different newspapers and began a radio program to exercise my voice and have a greater impact. All that came because of the space for self-discovery that the Miami Fellows gave me. As a Fellow, you build the confidence and courage to civically engage in your community. A leadership development program like this has a residual impact 10 or 20 years later. The professional growth of the Miami Fellows experience – whether they start a business, get appointed to a board or run for elected office – is a direct result of the skills they gain and relationships they build. When I started my own law firm, my wife Carla was going through a medical crisis and she had a successful kidney transplant at Jackson Memorial Hospital. A few years later, she was diagnosed with breast cancer. The Miami Foundation helped us start the Carla Hill and Hazel Bethel Breast Cancer Awareness and Organ Donation Fund using money from a birthday party. Now, the Fund helps provide more women access to mammograms and raise awareness of the high impact that breast cancer has on young women of color. I hope that in 50 years we have a community that communicates more and invests in each other. Philanthropy is democratic. I learned that it doesn’t matter if you have millions, or if you have hundreds. Every citizen in Greater Miami can make an impact to transform this community. Each of us must engage. Whether we engage with our talent, with our checkbook, or with our time, at the end of the day, Miami will only be as great as the investment we make in it. Marlon Hill is a partner with Hamilton, Miller and Birthisel and a former Foundation trustee. Marlon, your comments are definitely apropos regarding the impact the Miami Fellows can have on the individual. Hi Marlon! I’m so happy to be joining this group of hosts for the Miami My Stories. Thanks for all you do in the community.